Origin and Habitat: Bolivia-Santa Cruz, Comarapa, department of Mairanana (extent of occurrence =1,600 km2). Altitude: About 1500-2300 m over sea level. Type locality: Above Agua Clara in the neighbourhood of Mairana. Habitat and Ecology: This species grows in humid rocky outcrops in grassland and inter-Andean valleys. The major threats is habitat destruction through subsistence farming and agriculture. 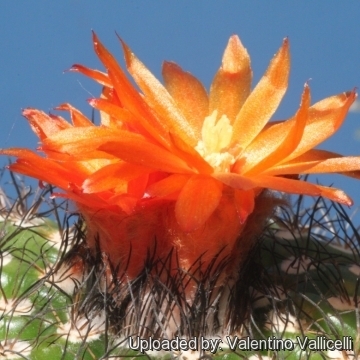 Parodia mairanana grows mostly in dense populations with many individuals. 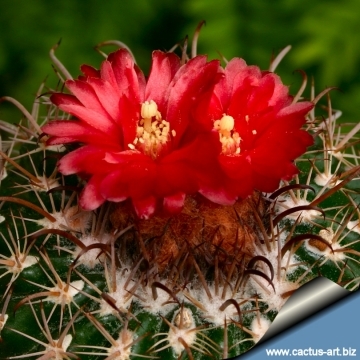 Description: Parodia mairanana is a small free-flowering cactus, with many apical flowers mostly orange tinged with red or rusty-red, but plants with different flowers colours are often found in cultivation. 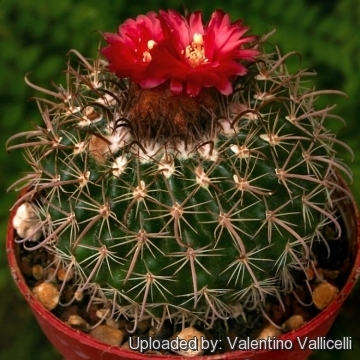 Remarks: Parodia mairanana is considered currently a synonym of Parodia comarapana and is assessed together. However some authors suggest to separate them as two different species. 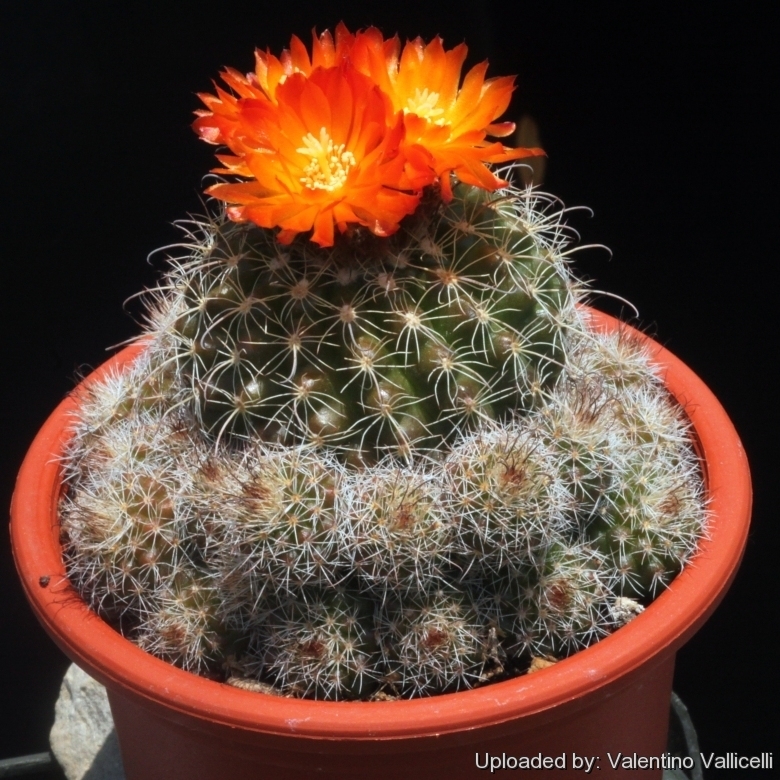 Parodia comarapana, as most Parodias, is quite variable and has received numerous names of controversial botanical value: Parodia mairanana is one of them. Habit: It is a small usually solitary or slowly offsetting around its base. In cultivation it is often found a very free branching form that readily fulfils a large bowl with dozen of heads in a few years. Stem: Small, greyish-green to dull green, attaining about 8 cm in diameter and 4,5 cm in height. Ribs: About 15 -16 (or more), forming small tubercles. Areoles: Young areoles are relatively large, and filled with abundant white wool. Later they are naked. Central spines: 3 or 4, very similar to the radials. One of the centrals appears longer than all others, and and may occasionally be more or less hooked. Flowers: Small, funnel-shaped, apical, mostly orange tinged with red or rusty-red (but ranging in color from yellow through pink to scarlet) 2-3.5 cm wide. Dried flowers remain for a long time on the plant body after blooming. Blooming season: Spring to summer, but with favorable conditions this one blooms almost all year, just taking "catnaps" in-between. Fruit: Red or green, with white hairs. 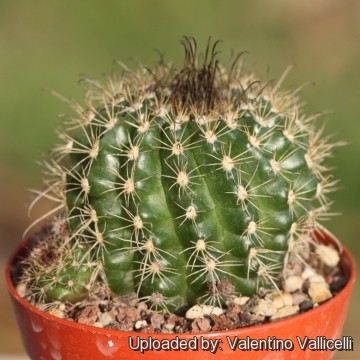 Cultivation and Propagation: Water these plants regularly, and fertilize with a low nitrogen fertilizer every 6 to 8 weeks, from mid-spring to late summer. This plant should remain rather dry at other times (especially in winter), except for a quick, periodic misting on warmer days in late winter. If it is kept absolutely dry for a long period, it tends to lose its roots in winter. 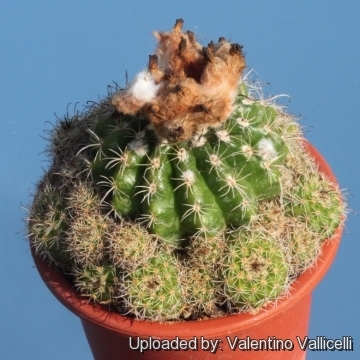 It can tolerate light frost (- 4C°), but rots easily if wet and cold. If the local climate is warm enough to grow this plant outside, be sure that soil is well drained and sun if full, but with protection from strong midday rays. 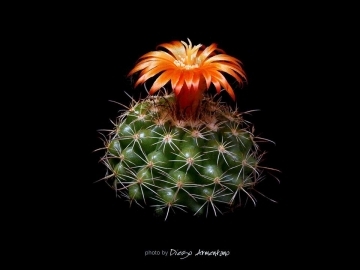 Propagation: By Seeds that are very fine. 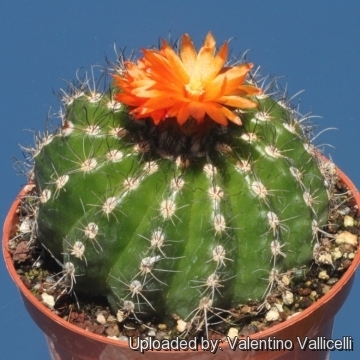 Patience is required when growing various Parodia species from their small, slowly germinating seeds, some of which take as many as two years to germinate.